I was standing beside my raised garden beds yesterday, staking my indeterminate tomato plants for the third time this summer, when Dan paused in his lawn-mowing and a few moments later came up behind me and tapped me on the shoulder. He held out his hand as I turned around: in it he had lightly grasped a small, dark snake with pale neck markings. I exclaimed something like, “Oh, a Ring-necked Snake!” and dashed inside to grab my camera before he could say a word. As it turns out, upon referencing my reptiles field guide, it’s not a Ring-necked Snake after all, despite its superficial similarities. Ring-necks (Diadophis punctatus; our subspecies is edwardsii) are the most well-known to bear this marking, but two other small snakes also do: Red-bellied Snakes (Storeria occipitomaculata; our subspp is occipitomaculata) and very young Northern Brown Snakes (Storeria dekayi dekayi; also known as Dekay’s Brown Snake). Although you can’t see it in these photos, this individual had a reddish belly, which rules out Northern Brown Snakes. The pale neck ring is solid in Ring-necks but broken into three large blotches in Red-bellies (occasionally not present at all, or only as a ghosted brown area, which has been the case with other individuals I’ve seen). So this is a Red-bellied Snake. It’s also a baby. Look how absolutely tiny it is! 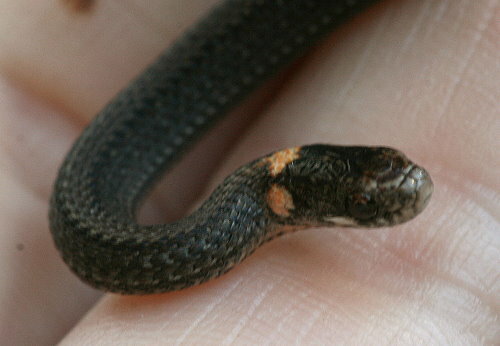 Many snakes give birth to live young, and the Storeria are among these. Baby Red-bellies are born at 7-10 cm (3-4 inches) long; they’ll eventually grow to reach 20-25 cm (8-10 inches) as adults. Ring-necks are a little larger at birth, and grow to be longer adults. Litters (broods? clutches?) 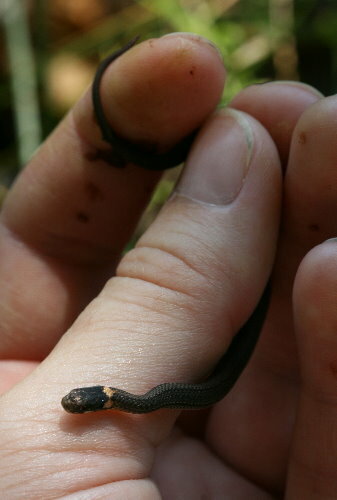 are usually around 7-8 snakelets, but can number as many as 20-30 (presumably from the very old, very large females). Adults are largely predators on slugs, so are great snakes to have in one’s garden. They’re also usually nocturnal, spending their days hidden under logs or stones, so I’m not sure why this one happened to be out and about yesterday afternoon. I’ve read that Red-bellies are very docile snakes not typically given to self-defense, and indeed this little guy made no attempts to bite or threaten, wishing only to get away. Though perhaps that’s because he knew his itty-bitty teeth would have been unlikely to puncture my skin anyway. I took a few photos then released him into the long grasses of the meadow, away from the mower. I’ve never seen a Ring-necked Snake so that would’ve been really cool, but it’s been a couple of years since I’ve seen a Red-bellied and I could count my total encounters with the species on one hand, plus this was such a little baby to boot, so it was still a great discovery. how sweet! this is one of my hubby’s fave snakes.. we’ve encountered many of them, but I’ve yet to see one with a neck band. They’re such docile beautiful creatures. Thank’s from the info, I learned from it. And I do captured one of those Redbellies beside our faucet outside the yard. But it was an South Eastern type in 9 inches long and it was in holographic neck color in white and green. Previous Previous post: Peterson moth guide update, and a contest!